Helps retire expired Safari bookmarks. Is there a better alternative to Safari Prairiefire? Is Safari Prairiefire really the best app in Internet Utilities category? Will Safari Prairiefire work good on macOS 10.13.4? 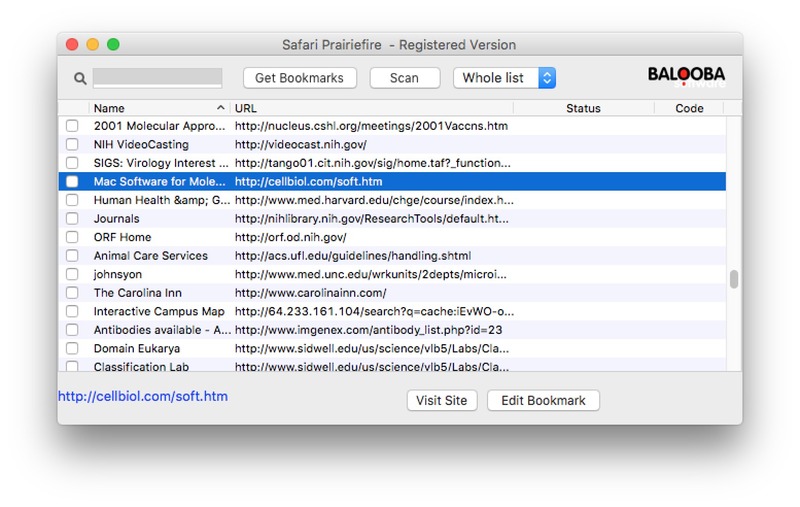 Safari Prairiefire helps retire old/expired bookmarks from within Safari. It displays Safari's bookmarks in a list, and determines if they point to dead and missing links. It can identify and help delete duplicates. Allows the user to delete any bookmarks without going to Safari. The user has full control over the process, can decide whether to scan through all bookmarks or a selection, and can also test individual bookmarks directly by launching them from the application. RSS feed URLs are supported. Prairiefire extends the support for the latest version of Safari in OS X 10.10 Yosemite by fixing a rare issue where certain bookmarks could cause Safari Prairiefire to revert bookmarks to factory defaults. This version also brings major user interface updates to windows, instructive dialogs and the menu bar and features a much requested re-worked progress bar.. This version is released as a free upgrade to all registered users and is recommended for all users. Special thanks to Hassan Agha for designing the new app icon.